Bittern in the ancient World. Bittern in Easton's Bible Dictionary is found three times in connection with the desolations to come upon Babylon, Idumea, and Nineveh (Isa. 14:23; 34:11; Zeph. 2:14). This bird belongs to the class of cranes. Its scientific name is Botaurus stellaris. It is a solitary bird, frequenting marshy ground. The Hebrew word (kippod) thus rendered in the Authorized Version is rendered "porcupine" in the Revised Version. But in the passages noted the kippod is associated with birds, with pools of water, and with solitude and desolation. This favours the idea that not the "porcupine" but the "bittern" is really intended by the word. Bittern in Fausset's Bible Dictionary (qippod. The accompaniment of the desolation reigning in Babylon (Isaiah 14:23), Idumea (Isaiah 34:11), Nineveh (Zephaniah 2:14). An aquatic solitary bird, frequenting marshy pools, such as the plain of Babylonia abounded in: the Al- houbara of the Arabic version, the size of a large fowl. The Botaurus stellaris, of the heron kind. Gesenius translates "the hedgehog" (from its rolling itself together; qaapad, "to contract oneself"), and Strabo says that enormous hedgehogs were found in the islands of the Euphrates. The Arabic kunfud resembles qippod somewhat. But the hedgehog or porcupine would never "lodge" or perch on the chapiters of columns," as margin Zephaniah 2:14 says of the qippod. Still the columns might be fallen on the ground within reach of the hedgehog, and Idumea is not a marshy region suited to an aquatic bird such as the bittern. Bittern in Smiths Bible Dictionary The word occurs in Isa 14:23; 34:11; Zep 2:14 and we are inclined to believe that the Authorized Version is correct. The bittern (Botaurus stellaris) belongs to the Ardeidae, the heron family of birds, and is famous for the peculiar nocturnal booming sound which it emits. Bittern in Wikipedia Bittern (botháurus vulgaris), a shy, solitary, wading bird related to the heron and inhabiting the recesses of swamps, where its startling, booming cry at night gives a frightening impression of desolation. 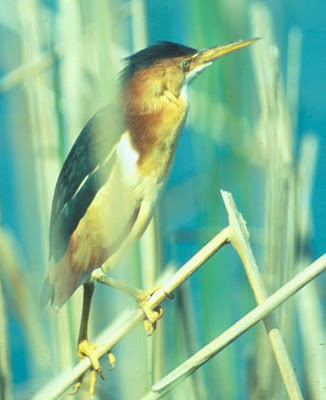 In the D.V., bittern stands for Hebr. qã'ãth (Leviticus 11:18; Isaiah 34:11; Zephaniah 2:14), although by some inconsistency the same Hebrew word is rendered Deut., xiv, 17, by cormorant, and Ps. ci (Hebr., cii), 7, by pelican. The pelican meets all the requirements of all the passages where qã'ãth is mentioned, and would perhaps be a better translation than bittern. Bittern Scripture - Isaiah 14:23 I will also make it a possession for the bittern, and pools of water: and I will sweep it with the besom of destruction, saith the LORD of hosts. Bittern Scripture - Isaiah 34:11 But the cormorant and the bittern shall possess it; the owl also and the raven shall dwell in it: and he shall stretch out upon it the line of confusion, and the stones of emptiness. Bittern Scripture - Zephaniah 2:14 And flocks shall lie down in the midst of her, all the beasts of the nations: both the cormorant and the bittern shall lodge in the upper lintels of it; [their] voice shall sing in the windows; desolation [shall be] in the thresholds: for he shall uncover the cedar work.